Sure you’ve heard of stuffed chicken, but have you heard of Miracle Noodle Stuffed Chicken? Stuffed chicken is a quick and easy way to add a broad variety of different foods into your diet without requiring much effort. Miracle Noodles, also known as Shirataki noodles, are originally from Japan. This pasta isn’t called a miracle for no reason. As it turns out, they actually contain zero carbs. Depending on the type of noodle you buy, you can find Miracle Noodles with almost no calories or carbs whatsoever. Wait, a pasta that is carb-free? But — how is this possible? Let’s first take a look at where Shirataki noodles come from in the first place. While many may think there has to be something artificial about these noodles to make them as low-calorie as they are, this is simply not the case. Miracle Noodles (and Miracle Rice) are actually made up of 97 percent water and three percent fiber. This fiber is called glucomannan. The glucomannan helps slow down the absorption of glucose by your body — in turn helping your blood sugar even out so you don’t have rapid bursts of energy along with the dreaded crash. With the macronutrients provided by this fulfilling and satiating pasta, it’s no wonder why it’s truly a keto lovers go-to pasta. These noodles take all the worry out of maintaining ketosis with their zero carb content. If you’re an individual following the standard ketogenic diet (SKD) this recipe is the perfect go-to meal for a high fat/low carb/moderate protein meal. The SKD requires individuals to keep their daily carb intake in the 20-50 gram range and is recommended for beginners just transitioning to the ketogenic diet. Thinking your days of consuming pasta are completely over? Think again! Stuffing your favorite protein with these Miracle Noodles is a sure way to feel satiated and full without the worry of going over your carb limit or getting kicked out of ketosis. While oven is heating up, prepare the miracle noodles by draining them and adding them to a pot of boiling water. Let simmer in water for 10 minutes. While the miracle noodles are simmering, sautee sautée spinach and avocado oil in pan on medium heat. Place chicken on cutting board and cut slices in them hasselback style, enough room to stuff with pasta and spinach. Drain the miracle noodles and add to the spinach pan. Mix in cheese. Mix all together. 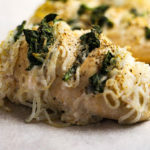 Add spoonfuls of miracle noodles, spinach and cheese to the pockets cut in the chicken breasts. Once all the pockets are stuffed, place the chicken on baking sheet covered with parchment paper. Place in the oven to bake for 25-35 minutes or until fully cooked.